Shock of all shocks, the IMF announced the Chinese yuan will not be admitted into the SDR until at least Sept. 2016. What exactly does this mean? I can tell you the gold community is so shell shocked and fearful at this point, it “must be bad for gold”, right? Going back a couple of weeks, China announced they had accumulated another 600 tons or so of gold to the near panic of precious metals investors. This announcement would be used as another shot at taking price down because the Chinese “don’t like gold as much as we thought”. This was the prevailing sentiment. What I think happened was China played “good boy” with the West and lied about their gold holdings. They announced enough gold to allow them into “the club” but not so much as to “offend” or intimidate anyone in the West. Their announcement was clearly bogus as they are importing 600 tons every three months …and we are to believe it took them six years? China had requested both “publicly and officially” to be included in the SDR. They were publicly humiliated with this move by the IMF. The Chinese are a very proud people, public humiliation would be last on my list of aggressions toward them! Make no mistake, they will retaliate. I believe just as the IMF did this while China is having market problems and during a period of weakness, China will return the favor to the U.S. …at a very inopportune time for us. When our markets are convulsing, probably this fall, you can expect one of two responses from the Chinese. They will either come public with a true and VERY LARGE number for their gold holdings, or they will threaten to and actually dump some Treasury securities/dollar holdings…or both! I believe their response will be timed to hit us just as in a boxing match, when we are tired, down or vulnerable …for maximum effect. Whether you want to believe it or not, the U.S. is in a financial war with nearly the rest of the entire world. To not include a rising China into the SDR makes no sense and is an impossible feat in the long term unless China decides it is not their desire. I see no upside whatsoever to this action. Does it “buy time” and postpone the inevitable? Maybe not. The action of poking the hornets nest may actually accelerate the collapse! There are other possibilities but looking at the two retaliatory options mentioned above, what could result? 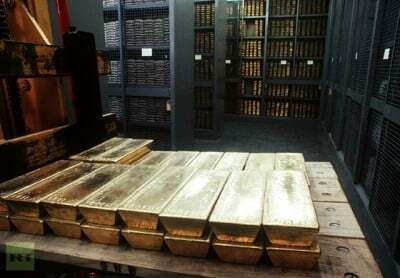 First, were China to come clean and “admit” they have 10,000 tons of gold (or MUCH MORE), the yuan would immediately strengthen and move into the dollar’s territory as a settlement currency. Markets would quickly do the math and understand if China has this much gold …where oh where did it come from? China could even do an audit publicly and count the bars out in the open surroundings of their Olympic stadium in a “we’ve shown you ours, now you show us yours” fashion! The other possibility comes with an “option A or B” for the Fed. If the Chinese decided to sell some of their Treasury holdings, could the Fed sit idly by? Option A, the Fed could let the market absorb the dumped Treasuries and allow interest rates to rise and watch as bond prices crater. This is not much of an option, especially in a world where all prices are generated and created “officially”. On the other hand, option B would be FORCED MONETIZATION! The Fed could decide they had to buy any and all Treasuries offered by China. I believe this is exactly what the Fed will decide they MUST do. Not coincidentally, the Chinese know this. They also understand by using this tactic, they will be forcing the Federal Reserve to create an “exit door” especially for …and because of them. This is the reverse of the old story, if you owe the bank $1 million they own you, if you owe $1 billion then you own the bank. You see, in this instance the Chinese have a direct lever on our credit markets. It would be bad enough if they could control our interest rates which they certainly can now influence. What makes this really bad is they can FORCE the Fed to either monetize or face the immediate collapse of credit markets and thus all markets. As I mentioned above, the Chinese will not do this until the time is right. The time will “be right” when our markets display weakness. They will smile while doing this and politely (publicly) restore honor and dignity. Before finishing and as long as we are talking about financial “war”, let’s briefly look at Russia. The U.S. and NATO are now crossing some very red lines in the sand when it comes to both Ukraine and Syria. Trainings and war games are taking place in western Ukraine while the U.S. is and has authorized airstrikes (with Israeli assistance) against Syria. Mr. Putin has said in no uncertain terms he will not allow the slaughter of Russians in Ukraine. He has also stated numerous times he will not stand by idly should allies Syria or Iran be attacked http://www.zerohedge.com/news/2015-08-04/russia-ready-send-paratroopers-syria . These are all very real sparks in the dry tinder of current geopolitics. The question you need to ask yourself is this, do you really believe the current fairy tale pricing of assets, ALL ASSETS will hold during a financial war with China? Or during a real war with Russia? This is not fear mongering, it is what’s on our dinner table!